Nightmares in Wonderland: Is it a fair trade? Oh Prednisone, have I ever told you that I hate your guts? Hang on ... potty alert ... sorry, I started to write this and realized if I didn't set this aside and go pee, I was going to wet the couch. It's microfiber! Just kidding. I am sorry for the TMI but it just happened. So, where was I? Oh yea, my hatred for corticosteroids. My corticosteroid in general. Prednisone. Side effects include ... weight gain. Most of this is water retention, and the 100plus ounces of water I drink a day isn't helping in the water retention. However, there is also the ravenous appetite that comes with it. I had been hoping the radiation making me nauseous would counteract the ravenous appetite but ... it hasn't. I am hungry ALL the time. I want to eat ALL the time. I've gained weight. I thought I had shed a few of those extra lbs but then this weekend, I ate too much and it swelled right back. Probably water weight again, but still not something a girl like me wants to see when I step on the scale. And I have to be weighed every week at radiation. They watch to make sure you are eating and not wasting away. I think they have some time before they need to think of me wasting away. Anyway, the number this week was the same as last week which I didn't want to see. So, I'm gonna be real strict with myself tomorrow. But, damn, prednisone. You're killing me. Aren't you supposed to be helping me? Today's zapping session went better than yesterdays. I forgot a hairtie yesterday so my mask fit differently without my teeny ponytail holding my head in that just right spot. I had to hold my head up into it. So, that made my neck hurt. Yay, another joint in my body hurting. Today I had my baby ponytail, yet they couldn't find a good spot for me on the table and had to do the images twice to make sure the laser beam would be in the right spot. It left me with an extra amount of pillow markings on my face. What are pillow markings? Let me show you! This is what my face looks like after radiation. It shows you how tight that mask on my face is. It leaves marks like this on my forehead, under my nose, my chin, my cheeks, my eyebrows. This is why I am glad I was able to drop off the Les Schwab payment before the zapping. I hate being anywhere in public after with this meshing on my face. 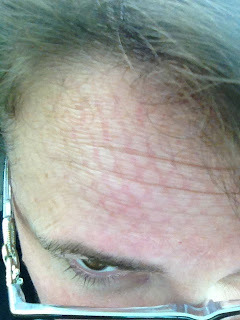 It looks like I fell asleep in a screen door!! I learned I don't have to wear my glasses, but, I can't wear my contacts right now. The laser isn't coming near my eyes but, the pressure I've been feeling behind my eyes makes them uncomfortable. So, I still wear them. I've been getting some compliments but, it's just not the same. I like being free and having loose eyeballs to see every which direction. I also hate my face so, having something like glasses on it doesn't help the situation. Today, I went onto my Kaiser health planner thing and was looking at my past results because I'm going to go back in for another thyroid blood test probably tomorrow or the next day. I checked in my "Ongoing Health Issues" to see what they have me classified as. Apparently, I have three concurrent diagnosis. Not just two. Oh lucky me. I do have what is called Hashimoto's Thyroiditis. My immune system also attacked my thyroid. This is all separate from Wegener's Granulomatosis. That autoimmune disease doesn't touch the thyroid. But, apparently, my body decided my thyroid was also a foreign body. So, Hashimoto's, my plasmacytoma, and ... there it was, actually written in my file Wegener's Granulomatosis/Granulomatosis with Polyangiitis. It gave me some comfort to see it there. Now, if I go into the emergency room for any of these reasons, it's there. The doctors that I see can see that now, I won't have to keep explaining it as I had to every time I was bounced to a new specialist. I did some research on my new medication that's upcoming. I'm gonna lose my hair, there's no avoiding it. It may not fall out completely but it's gonna come out enough that I think I will end up returning to work without the only part of me that I really liked ... my hair. But I'm OK with that. I'm glad I kept all my hats. The meds are given based on weight, so many mgs per lb. I am fat. It's the truth. I'm not looking for sympathy. I am overweight, it's a fact. Which means, I have to take A LOT of this medicine which is going to mean I'll have some significant side effects. But you know what? I'll go bald, I'll be nauseous for a few weeks, I'll vomit every day if I have to. My disease is fatal if not treated. I'd rather be bald than dead! So what if I have huge eyes already. I'll just have to learn to put on some good makeup to try and make my face pretty in the absence of my hair. It's just hair, it will grow back and it's not like it would look bad becauase of a crappy haircut. It will be a sign of what I overcame, what I fought back against and that I am still alive. So yes, Prednisone, I hate your ever-loving guts right now for making me gain weight. I hate that you make me weak on top of the fatigue from radiation. I hate what you are doing to my body. I'm gonna hate your pal Cytoxan too, believe me. But, you are both here to keep me alive and for that, I will take whatever it is you think I need to suffer through. So bring it, drugs, bring it on. Oh, and I wrote today. 10 pages 5676 words. I know real authors probably do so much more than that but, I've done it three days now. My "novel" is 27 pages long. Well, 27 full 8.5 x 11 pages. Who knows what that would translate into on those lil book pages. Maybe I might even let someone take a peek at it. Maybe. I don't know. It's still so raw. But, I am excited that I am actually writing again. It feels good. It feels like me. Maybe, when I'm finished, I'll do one of those Kickstarter pages to get funding to try and get it published. Ah, the things I could do if I could make extra money writing. Maybe buy a house with a writing nook in it for me? A girl can most certainly dream. Especially with the amount of free time I have write now!